When the first dingoes travelled upon land bridges from Asia to Australia some 18,000 years ago, they found a country rich in provision that was occupied by a people who readily accepted them into their lives. Of all animals, the dingo is one of the most well-represented in Indigenous Australian mythology, and is included in the Dreamtime (the creation of life, humans, plants and animals) and the Dreaming (core Indigenous values and spirituality). Throughout Indigenous Mythology dingoes are believed to live in the physical and spiritual realms, and considered valuable camp guardians due to their ability to perceive evil spirits that are undetectable by man. Dingoes were revered by Indigenous nations as ‘creators’, who were an irreplaceable part of ‘country’ and equal to man. Indigenous Australians would often acquire dingo pups from dens and tame them. They were shown great affection, and were given names, slept with humans at night, and were protected jealously. The dingo was so sacred in some tribes that women would nurse dingo pups from their own breasts. 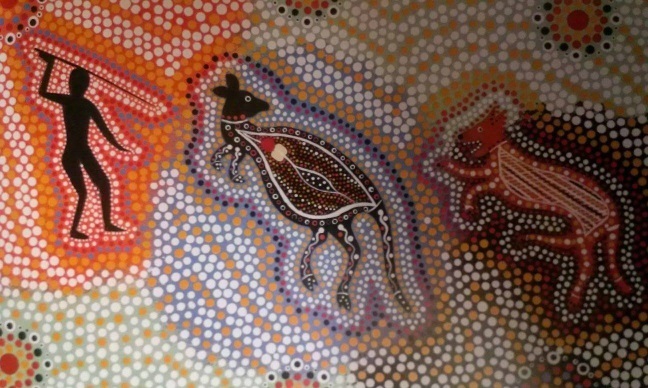 The significance of the dingo to Indigenous Nations is best conveyed through Dreamtime stories of different Nations. 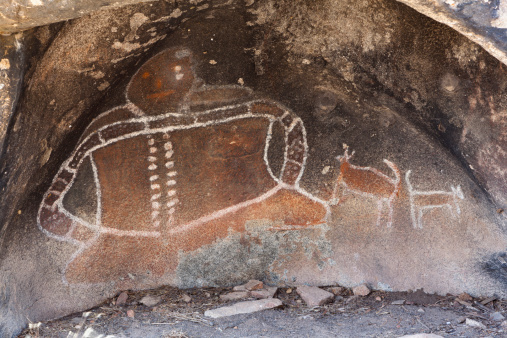 When he had created the beautiful sandstone ranges of Gariwerd, he often took the form of Werpil the Eagle so that he could view his work. He looked over the cliffs and the mountains. He listened to the sound of water, dripping after rain and thundering over waterfalls. He watched the plants and animals grow- from moss and tiny blades of grass to tall sturdy gums; from birds that flew to animals that burrowed through the soil. Bunjil had a special place near Gariwerd. From there he could look out over the ranges. He is pictured there in Bunjils Shelter with his two helpers, two Wirringan, or dingoes. Bunjil appointed two brothers, the Bram-bram-bult brothers, sons of Druk the Frog, to finish the task he had set himself. Their job was to bring order to the new world; to name the animals and creatures, to make the languages and give the laws. off towards the west. He chased him through Barigar, right to the other side of the range. Waa spoiled another crack in the rockface. Desperately he tried to hide in it, but again Tchingal delivered a mighty kick to the rock and split it right open. This is how Jananginj Njaui (Victoria Gap) was formed where Bugara (Glenelg River) passes out onto the western plains. With the sun low on the horizon, Tchingal decided to make his camp at the foot of the new gap. This is why the place is called Jananginj Njaui, which means “the sun will go”. The next morning Waa rose early and escaped to the nearby Moora Moora swamp. As this was his totem site, and therefore sacred territory, Tchingal was forbidden to follow him there. Tchingal was angry and he was also very hungry. Just at this moment he spied a man, Bunya, out hunting in the distance. He decided to make a meal of him. When Bunya, who was not very brave, realised the emu was after him, he took off as fast as he could. Instead of using his spears to protect himself, as a warrior should, he threw them to the ground and scrambled up a large tree. Tchingal, not being able to climb, decided to wait. He knew that Bunya would have to come down some time. They came down to the mountains and saw what they thought was a bright star shining- it was Tchingal’s eye. Approaching the bird from different directions, the brothers crept up and threw their spears. One struck the emu in the chest, one in the rump, and one in the neck. Tchingal raged and stormed at the brothers, but he was fatally wounded. He ran off towards the northern plains, losing blood all the time. Soon he died, and the trail of blood he left behind him turned into the Wimmera River. Tchingal himself is the dark shape that lies next to the Southern Cross. The eastern star of the Cross is Druk, the mother of the Bram-bram-bult, and the two brothers are the Pointers of the Southern Cross. Waa the Crow is at a safe distance on the other side of the sky, as the star we know as Canopus. Warrigul, the old dingo, crept towards the black wallaby. Tired and hungry, he moved with great care, because he was much too old to run down the bunderra if it spotted him. He was almost within striking distance when the wallaby raised its head sharply, spun on its hind legs, and was gone. Warrigul wondered what had startled the bunderra, so he kept low and watched. He did not have long to wait. An old mundurra, a hunter, appeared out of the scrub. Warrigul growled angrily to himself, then sighed and decided to remain hidden till the old man had gone. The old man was just as angry, because he too had been tracking the bunderra. He too was wondering what had startled it, when out of the corner of his eye he noticed the crouching Warrigul. "You're not as good to eat as a bunderra," he muttered, "but I am so hungry that even a skinny warrigul will do." When Warrigul could run no further, he turned on the mundurra. "Why do you chase me, old brother?" he panted. The old mundurra scratched his beard as he considered this. Then he rested his tura on the ground and sat down to get his breath back. The Warrigal (old dingo) and the Mundurra (hunter) stalking the bunderra (black wallaby). "If we are brothers," he said finally,"and perhaps we are, then we should hunt together, and share what we catch. We might both eat better together than separately." And so they did. The old man and the old dingo hunted together, shared food and campfires together, and became close friends. So did all their descendants- men and dogs- who can be seen together in any baanya, or camp.